She felt his eyes on her for some time before she allowed herself to turn around. As nonchalantly as possible, her eyes scanned the crowd expecting to meet his. He was out of sight and she forced herself to turn back to the elderly lady who was giving an intricate explanation of the wedding preparations of her grand-daughter. She attempted a smile that indicated interest, but her mind bolted in a different direction entirely as she wondered where he had gone. The champagne was going to her head now and the waitress drifted past with a tray of appetisers. Desperate for something to do with her free hand, Maya grabbed a samosa, took a bite and held it awkwardly as the lady finished her detailed description of each piece of jewellery that was given to her grand-daughter by the in-laws. The lull in the conversation was exactly what Maya needed. She expressed the required niceties and broke away to scout the room for him once again. And as she turned, there he was. Standing at her elbow, his dark skin luminous and his playful dimples twinkling. “Can I get you another drink?” he smiled. Maya tried her most alluring smile and taking that as a yes, he saw a passing waiter and reached for a fresh glass of champagne. As he turned away, Maya nervously took another bite of her samosa, wishing to make it disappear so that she could go back to elegantly sipping her bubbles and flirting with the beautiful stranger that inexplicably seemed interested in her. 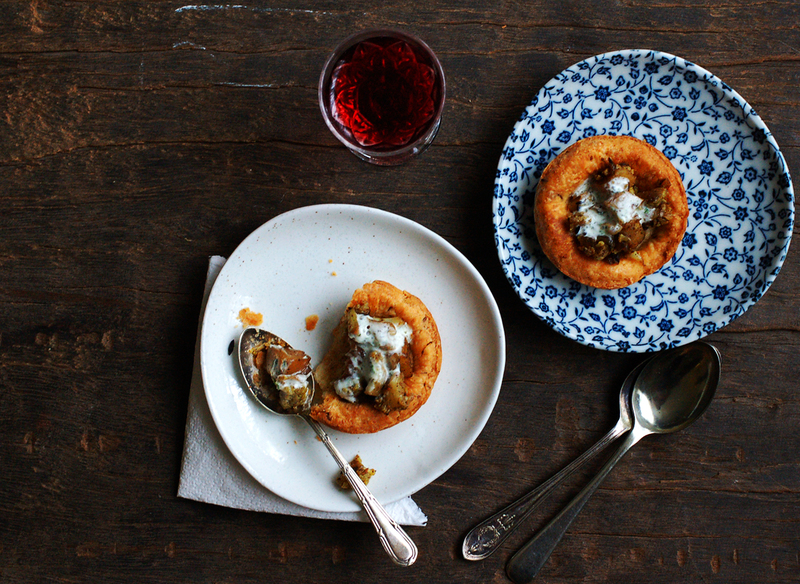 To avoid similar samosa- related disasters, I have for you baked samosas that are in tart form. Two or three bites should do it and the thick, wonderfully flaky, sour-cream pastry minimises chances of such mortifying situations as poor Maya faced. 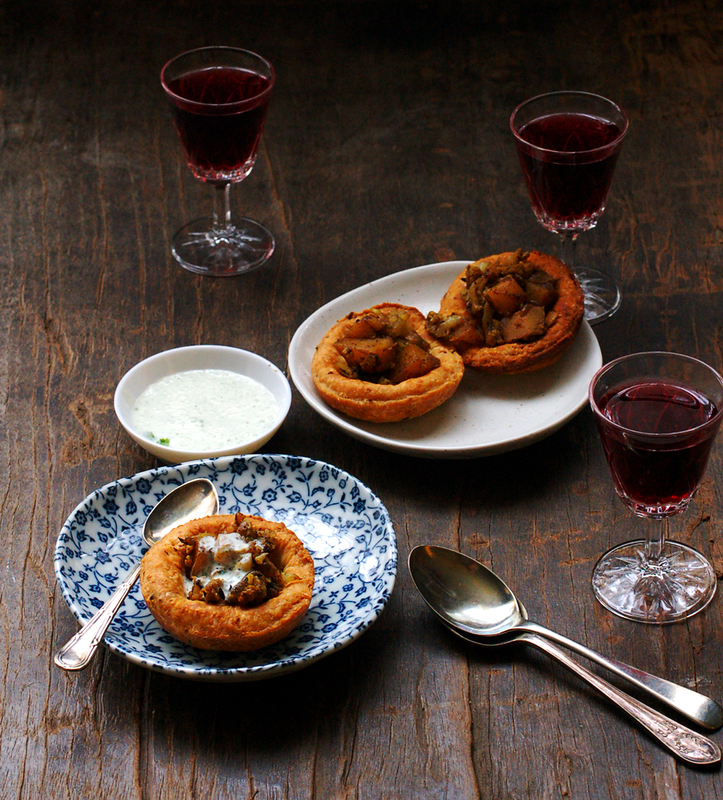 Serve with the mint yoghurt sauce, as well as this tamarind and date chutney, dollops of which can be spooned into the tarts just prior to serving. I also used a combination of cauliflower and potato to reduce the carbohydrate content of the whole thing. In other news, if you haven’t had enough of my babble in this space, or if you have somewhat let the fitness regime slip by over the holidays, head on over to Saute Magazine to read my thoughts on Exercise. Roast the cumin and ajwain seeds in a small pan until fragrant. In a large bowl, mix the flour, salt and roasted seeds. Add the butter and use clean fingers to knead the butter into the flour until it is a smooth, crumbly mixture. A few larger chunks of butter the size of small peas are fine. In a small bowl, whisk together sour cream, lemon and iced water. Pour the mixture into the flour and butter. Uing your hands again, gently mix, then lightly knead the mixture until it is one mass. The kneading should be minimal and just enough to get the dough into a ball. Wrap in cling film and chill for at least 20 mins. The dough can be prepared a few days early and refrigerated. Boil the diced potatoes in salted water until they are cooked but still firm. In a large non-stick pan, heat the oil. Add the cumin seeds and once they are popping, reduce the heat to low and add the ginger. Fry for a minute or so, then add all the spice powders except for the amchur and salt. Fry for 2-3 minutes. Add the cauliflower and 1/2 cup of water, 1 tsp salt and amchur. Stir, cover and simmer until the cauliflower is tender but firm, stirring intermittently (6-8 mins). Drain the potatoes and add them to the pan. If the mixture is dry, add a further 1/4 cup water. Stir through and taste- add a little more salt if needed. Stir and cook uncovered until the mixture is reduced so that there is no gravy. Place the ingredients in the bowl of the food processor and pulse a few times until they are well blended. Taste and add a little more salt if needed, however the mixture should be on the slightly sour side. Roll out the dough to 5 mm thickness. Using a large cookie cutter (I used a bowl that was 9 cm diameter), cut out rounds in the dough. Place the rounds at the base of tiny tart pans, a muffin pan or patty cases. The edges should turn up to form a shallow tart shape. Bake on the middle shelf of the oven until the pastry is cooked through, about 15 mins. Cool and turn the cases out onto a plate. Spoon the filling into the cases. The tarts can be made in advance and warmed in a preheated oven (160 C) for 5 mins before serving. Dollop with yoghurt sauce and tamarind date chutney just before serving. ← Ricotta, Sweet Potato and Chilly spread + Happy New Year! Such a cute story…and a unique recipe idea! 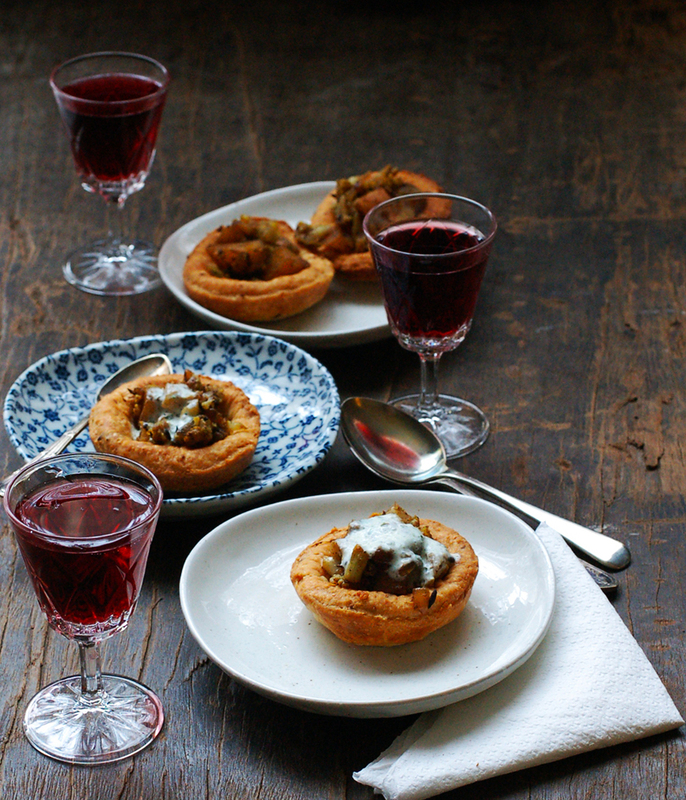 I love samosas…samosa-tarts are just brilliant. Love the idea of this recipe – I’m going to have to try them methinks! This is such a neat idea..totally making it next time samosa craving hits! Thanks Tanvi, I hope you get to try it. Haha, what a fun story! 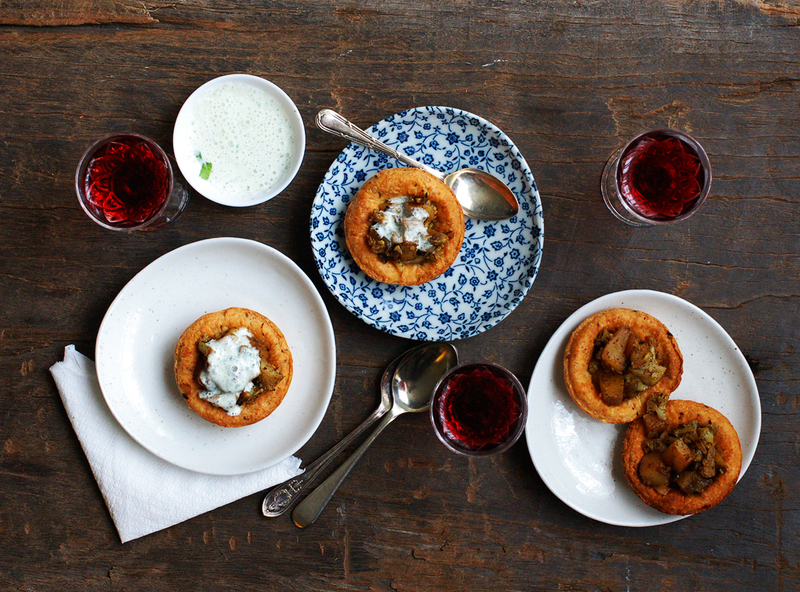 Stumbled upon your blog while searching for anyone who had baked samosa tartlets – instead of frying! Am making these for an upcoming event, and loved reading your post. Thank you Shuchi…..lovely to have you here. Did you end up making them? I hope you liked them!